The 2009 mitsubishi outlander electric vehicle qualifies for a federal tax credit of up to $7,500, effectively reducing the net base price. It seems fairly obvious that if you build a vehicle with the right looks, the right equipment and the right price, success is sure to follow. That's the case with the Mitsubishi Outlander, a phenomenal crossover SUV with an impressive list of standard and available equipment unmatched by anything in its class. Sharing its platform with the Lancer sedan (and the hot-performing Evo sport variant) the sporty Outlander sets new standards in refinement and performance. Combined with available features that include a hard drive-based navigation system, rear-seat DVD entertainment system, 650-watt audio system, Bluetooth hands-free phone interface and keyless entry and start, it wouldn't have been surprising if Mitsubishi had also given its compact crossover a new name. Like the latest Toyota RAV4 and Hyundai Santa Fe, the Outlander also offers a small, "just in case" third-row seat. Arguably the most tech-savvy vehicle in the category, the 2009 Mitsubishi Outlander is further distinguished by a combination of energetic driving dynamics and an available third-row seat. If you'll be using a third-row seat with any regularity, you'll definitely want something bigger. While the stable and confident Outlander isn't one to turn its nose up at a little enthusiastic driving, it's not as sporty as the Mazda CX-7, for instance. A third-row seat is now offered on the four-cylinder SE trim, while a backup camera is added to the XLS' available navigation system. Rain sensing wipers and auto on/off headlamps are added to the available Luxury Package. While the sportiest crossovers on the market can actually encourage spirited driving, the 2009 Mitsubishi Outlander tends to simply tolerate such frivolity. Still, that's enough to qualify it as livelier than most. Excellent steering and brake feel, a well-tuned suspension and supportive front seats combine to deliver a balance of comfort and confidence that will accommodate a range of driving styles. Even when we had to use all the available horsepower to do so, the Outlander never had trouble merging or passing. Not surprisingly, we had the most fun in the most expensive model – a four-wheel-drive XLS – which seems to handle corners more responsively than front-wheel-drive models and includes steering wheel-mounted paddle shifters. The Outlander's hard drive-based navigation system is refreshingly quicker and more responsive than more common DVD-based units. It also allows you to store up to six gigabytes of digital music. The available FAST Key system lets you unlock and start the Outlander without even touching the key/transmitter. By several measurements, the Outlander's available third-row seating area is the smallest in the category. For a group trip that includes one or two kids, however, that extra capacity is enough to turn a two-car convoy into a single-vehicle jaunt. By collapsing flat into the cargo floor when not in use, it's basically a "why not?" feature. For their parts, second-row passengers in the XLS can slide and recline their way to maximum comfort. Well-bolstered front seats and a very modern instrument panel with a technical aspect to its appearance further the new Outlander's more vigorous, even athletic demeanor. The second-generation Outlander commands a much larger presence than most vehicles in this category. LED taillamps and available HID headlamps help communicate the new level of refinement, while an innovative "flap-fold" two-piece tailgate – with a bottom section that folds level with an already low load floor – provides for easy cargo loading and unloading. It also functions well as a bench or table for outdoor activities. The wheel lineup ranges from 16-inch steel wheels to 18-inch alloys, and top-line XLS models can be identified by chrome-plated door handles, side sills and grille bar, plus dual exhaust outlets. Standard equipment included on the base Outlander ES includes air conditioning, power windows, locks and mirrors, remote keyless entry, cruise control, engine immobilizer and an AM/FM/CD/CD-MP3 audio system. Standard safety equipment includes Active Stability and Traction Control (ASTC), anti-lock brakes (ABS) and front, front-side and two-row side-curtain airbags. The SE trim adds fog lights, 18-inch alloy wheels, 650-watt Rockford-Fosgate audio and the FAST Key entry system, while the top-line XLS trim tosses in a the 3.0-liter V6 engine, Sportronic shift paddles, automatic climate control, six-disc CD changer and Bluetooth hands-free phone connectivity. The Outlander's premium-like list of optional equipment is, for the most part, in packages, and includes leather seats, heated seats, a sunroof, Bluetooth hands-free phone interface, 40 gigabyte hard drive-based navigation with rear backup camera, rear-seat DVD entertainment system, FAST Key keyless entry and start, 650-Watt Rockford Fosgate audio system, auto on/off headlamps, rain sensing wipers, SIRIUS Satellite Radio and an auxiliary audio input. 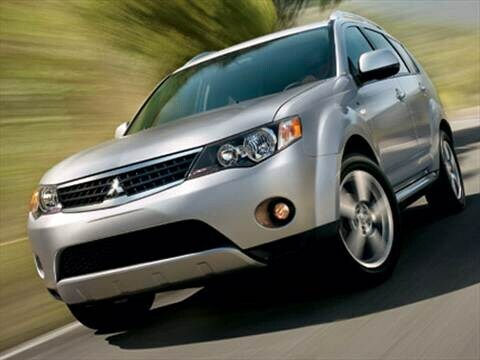 The 2009 Mitsubishi Outlander's 3.0-liter V6 isn't the most powerful in the category, but, by generating 90 percent of its peak torque at just 2,000 rpm, it's responsive around town. The base 2.4-liter engine and CVT transmission help reduce the price, but seem to sacrifice a good deal of power for not much better fuel economy. Power is routed to the wheels via a manually selectable six-speed automatic transmission with available steering column-mounted paddle shifters. The Outlander is available in front-wheel drive or three-mode four-wheel drive (FWD, 4WD Auto, 4WD Lock), both with electronic traction control. Towing capacity is rated at up to 3,500 pounds. The 2009 Mitsubishi Outlander ES' Manufacturer's Suggested Retail Price (MSRP) starts around $21,500, with the all-wheel-drive version selling for about $24,000. The SE starts around $25,000, while a fully loaded XLS with all-wheel drive tops out around $35,000. Our Fair Purchase Prices to reflect real-world selling prices, so be sure to check them out before heading to the dealership. Competitors like the Toyota RAV4 range in price from about $22,500 (four-cylinder) to a loaded $35,000, while Hyundai Santa Fe MSRPs range from $22,500 (manual transmission) to more than $31,000. We don't expect the Outlander to maintain resale value as well as the exceptionally resilient RAV4 or even the Santa Fe.